Report by AAA Board member Rita Banea. Picture left: Photo of Dr. Joseph Ciccone (chairman of the Carmen Carrozza Scholarship Dinner-Dance) and Petar Maric. 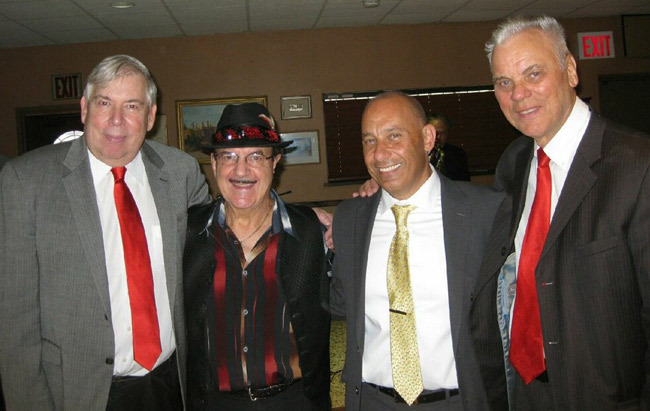 The AAA holds an annual fund raiser event to benefit The Carmen Carrozza Scholarship Fund. The event features many artists who have donated their time and talents for this worthy cause. The Carmen Carrozza Scholarship Fund was founded in the spring of 2002 at the suggestion of and through a generous donation from the American Accordionist`s Association (AAA) Presidential Advisor, Steve Stolaruk. 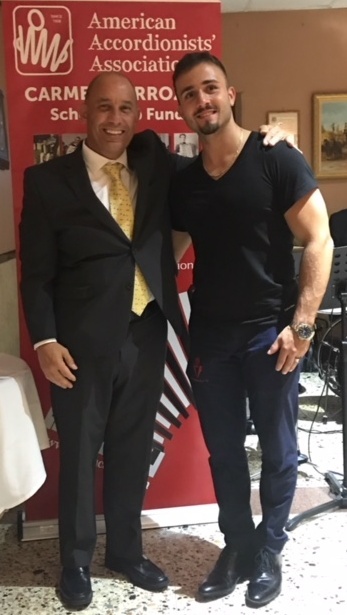 Mr. Stolaruk presented his generous gift at a special AAA Lifetime Achievement Award banquet honoring the world renowned Concert Accordionist Carmen Carrozza, which took place in New York on March 17, 2002. This was the first Lifetime Achievement Award presented by the AAA. 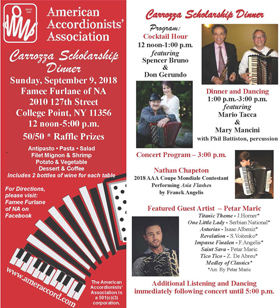 "The 2018 edition of the American Accordionists' Association's Carmen Carrozza Scholarship Dinner (Dr. Joesph Ciccone - Chairman) was held on Sunday, September 9th at the Famee Furlane of NA in College Point, NY. The guests were treated to vast array of accordion music and styles. Very tasty jazz music during the cocktail hour was supplied by the duo of accordionist Don Gerundo and woodwind specialist Spencer Bruno. This was followed by festive dance music supplied by accordionist Mario Tacca and percussionist Phil Battiston. Mary Mancini's cameo set contained outstanding renditions of “Ciribiribin” and “Non Ti Scordar Di Me”. Her stirring rendition of “America the Beautiful” brought the room to its feet. Accordionist Nathan Chapeton performed Frank Angelis' “Asia Flashes”. Four times Confédération Internationale des Accordéonistes (CIA) champion Petar Maric was the featured guest artist for the afternoon and he certainly did not disappoint. His outstanding performance literally had the audience mesmerized throughout. At times you could hear a pin drop - the room totally silent as he played. That is a difficult feat to attain by a performer but Petar Maric consistently achieved that. Each of his selections, “Titanic Theme”, “One Little Lady”, “Asturias”, “Revelation”, “Impasse Finalen”, “Saint Sava”, “Tico Tico” and Medley of Classics were so carefully and creatively orchestrated using so many of his Bugari Evo accordion timbres. He received several well earned standing ovations." The purpose of the fund is to grant a music scholarship each year to a deserving young contestant who participates in the Piano Accordion division - Carmen Carrozza Scholarship Solo at the annual AAA competition.. The contestants must play one of any chosen AAA contemporary commissioned works, or any other contemporary composition written for the accordion and receive a score of 95 or above in order to be considered for a Scholarship Award. The first place winner receives a scholarship. Maestro Carrozza is particularly celebrated for his brilliant world premieres of the early AAA commissioned works in the 1950's and 1960's and suggested this policy. Christopher Gorton was the first recipient of this award in 2003. Carmen Carrozza holds an important place in the history of the accordion. His legacy is ongoing and Carmen Carrozza continues to inspire future generations of accordionists.